1*. The UAC off the Mumbai coast, descended to sea level on Saturday. The Low is expected to dissolve by Sunday evening. Rainfall decreasing in Konkan and Interior Mah from Sunday evening. 2**. Another Low is expected to form off the North Konkan/Saurashtra Coast around the 24th/25th of September. Seeing the developments possible, this may develop and deepen, and as AS-1, track Westwards into the Arabian Sea. 3. South West Monsoon will withdraw from Rajasthan and Kutch by 19th of this month. And subsequently from Punjab in the next 2 days. Monsoon may withdraw from NCR around 26th of September. *1(a): Mumbai: Vagaries had clarified, that depending on the exact location of the UAC, 100 kms North/South of Mumbai cold be the range of rainfall along the coast. As shown in maps ( In Vagaries) on Friday and Saturday, this trough and embedded UAC has produced rainfall upto 100-350 mms. In the North (Dahanu 120 kms had 345 mms) and South (Murud 120 kms had 230 mms) of Mumbai. Mumbai received an average rainfall of 23 mms as on 15th morning, 68 mms on 16th and 76 mms on 17th. Rains will persist in the Mumbai region on Saturday night and Sunday. Frequent showers on Saturday night and Sunday.Next 24 hrs, from Saturday mid night- Sunday mid night Mumbai can bring up 60-80 mms. 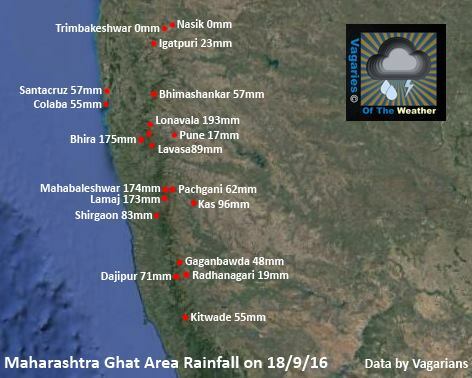 Saurashtra had good showers on Friday and Saturday(mentioned in LTF on Tuesday). South Gujarat region coast and Coastal Saurashtra will get thunder showers on Sunday. Surat: Chances of a couple of heavy showers on Sunday. Next 24 hrs,30-50 mms till Sunday night. **2(a): On forming, AS-1 may bring rains again to North Konkan around 23rd. (If on schedule, Mumbai may get another spell on 22nd or 23rd). Showers will also cover the South Saurashtra Coast. Sir how much chance of rain in Gujarat for next 3 to 4 days? We have got some rains after 7 pm to 10 pm could be around 40-50 mm. Patel hiten can u specify which area of guj? Entire night it rains pounded over Navi Mumbai (150mm i guess) - this must be wettest september, all 4 moths june-sept MAHA received excess rains.. Looking at this Mumbai annual may reach 2500-3000mm! Thank u for providing detailed weather analysis from time to time . its not always about forecasting all the time , but your knowledge of the subject is very impressive . i found some article which i would like to share with u all . Apologies I still feel many south Indian places are in process of desertification. Here is a page 2 from the same report. 2015 numbers are not mentioned here but we all know it was a huge surplus. There is absolutely nothing to suggest desertification of South India is underway.